Risk is something every leader knows well. No decision in any organization occurs without some potential for loss. We all need to become comfortable with some risk. We are never going to eliminate all risk. So our best course of action is to prioritize risks so that we can manage those risks that are the most dangerous to our organization effectively before they have the opportunity to negatively impact us. Addressing each of these risk factors in a way that allows your organization to take advantage of the best opportunities should be an ongoing consideration. While you never fully eliminate risk, you can practice getting better at managing risk in a way that it doesn’t cripple our ability to take advantage of opportunities. What Does Managing Risk Look Like? At its most simple, risk management is a process of forecasting and planning for potential challenges to your business or project. When done correctly, risk planning enables you to prioritize risk and work to eliminate or lessen the impact of the potential risks on your project or business. 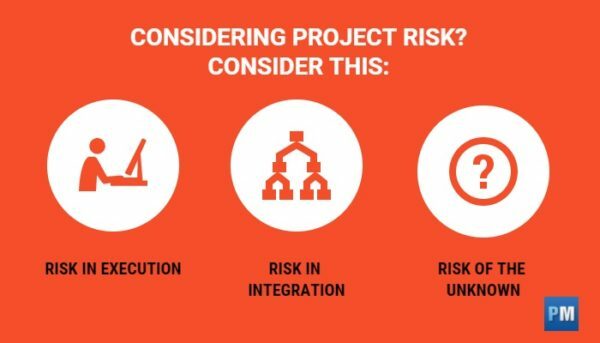 Identify the risks: ID potential risks to your project or outcomes. Analyze: Analyze your risks and their likely impact on the project. Prioritize risks: Rank the risks according to likelihood they will happen and how much damage they can cause. Mitigate the risk: Take the most challenging risks and work to get in front of them before they start causing trouble. Monitor: Keep an eye on the risks you planned for and make sure you maintain awareness of new risks that may be coming in your direction. The key with risk management is to do it early and often. Waiting on risk planning is almost guaranteed to lead you to a position where you are tense, stressed out, and dealing with something that may have been avoided…and probably should have been. So how should you approach risk management when working within the 3 big risk areas? What is managing risk in a project look like? Let’s break down each individually. This probably jumps out to most of you right away. How to make a project come in on time, on budget, and successfully is often the first consideration that comes to people’s minds when they are tasked with a new project or trying to build up a new idea. Risk during the execution stage comes down to planning for what could potentially happen. The great thing about planning for execution and managing risk aggressively is that early on in a project, you are going to have the best chance to mitigate these issues because you are going to have the best access to people, money, schedule flexibility, and any other potential factors that you can use to manipulate the project in your favor. This means that you also have the most opportunity to shut down risks and control them. Budget: Do you have enough money to finish this initiative on time? People: Do you have the right people? Enough people? Technology or equipment: Do you have the tools you need? Stakeholders: Have your stakeholders bought in? Are you aware of your champions? And, do you know who your detractors are? The key here is if you spend time planning in advance of the first action, you can take a lot of risk off the table early. This is always going to be cheaper and more effective than dealing with it later. Integration often comes to mind when we talk about mergers. That idea helps us here as well. Any number of reasons can cause the integration to fail. The best way that I have for thinking about integration and risk is to keep in mind that integration is about change. This will help you plan and manage the process more effectively. Here are some ideas and guidelines to help you ensure that integration is as seamless as possible. Make sure your initiative isn’t disruptive of other operations: In some instances this is going to be unavoidable. In most, the new initiative is going to become part of operations. The risk here lies in making sure you are aware of whether or not you want the new process or tool to supersede the old. Ensure you have the proper buy-in: Buy-in can make or break your integration. There is tremendous risk in not having the right people on board. So always focus on the key people that you need to support you. Understand the complexity of what you are attempting: Any project is complex. Even the simplest ones require a certain amount of understanding and new skills. To make sure that you don’t fail here, you need to make sure that you understand the amount of fear that is derived from change coming into an organization. This list is far from comprehensive. But it outlines the idea that even as you have planned out risk in the execution process, it doesn’t mean that you are finished worrying about risk. Risk is something that is going to be with you until the last task is finished. Probably the toughest thing to manage is the unknown. The unknown is difficult to manage because you really are making plans for things that you can hardly imagine, but you still have to plot risk on your project. That makes managing the risk of the unknown a bit of an art. In the real world, we have seen more powerful storms than ever before with Hurricane Sandy, super storm Sandy, and Hurricane Irma. These events have been called “100 year storms” to explain the incredible rarity of these events. For us, we can consider them unknowns. As the storm began to consistently track towards a direct hit of Florida, Florida’s governor immediately began emergency prep, calling for evacuations, and putting a plan to mitigate risk from the storm into effect. With each passing day, the governor continued to advance the communications that the storm was dangerous while giving his teams the resources to evacuate populations, solidify structures, and buttress as many vulnerabilities as possible. During the storm, federal, state and local officials continued to monitor the storm and its impact and worked to take action as soon as it was safe to return to the streets. In the aftermath, the planning allowed the entire disaster relief team to move at once to rescue, repair what could be handled immediately so that they could move quickly onto the long-term rebuilding that would be needed in certain areas. While simplistic, the example teaches us a few things about managing the risk of the unknown that can be applied in any situation. Monitor your environment constantly. You don’t know when an unknown is going to interrupt your project. So you have to keep a level of awareness that enables you to identify them as early as possible. Communicate the risk and potential implications of this unknown consistently. Because these things are rare, you often have a level of reluctance to act. You must use consistent communication to overcome this. Make sure you have a way to deal with the ongoing crisis. It’s unlikely that you are going to have perfect information before or during a major You can make sure that you are doing everything to monitor the issue, control for it, and use your resources effectively to manage it. Once the unknown risk has passed, you are going to have to recover from the disruption. This will take some creativity and some persistence. Because the risk was unknown, you won’t really know what you are dealing with until after the crisis has fully passed. This is its own form of unknown. So, make sure that you are clear about getting all the information on the table ASA Having the clearest picture of what you should overcome will enable you to take the most aggressive action to get back on firm footing. The key to managing the unknown is to have a plan of attack, maintain flexibility, and to always make sure you are learning the reality of the situation so you can adjust your actions accordingly. In truth, that is the key to successfully managing risk for any initiative or at any stage of a project. Because the likelihood of you finding a risk-free project is probably like having another unknown never disrupt another project. You can’t avoid risk, but you can prepare for it. One way is by equipping yourself and your team with the best tools for the job, something that can monitor and report in real-time, so when issues arise you can resolve them before they become problems. The cloud-based ProjectManager.com reports instantly on a project, reflecting team updates as they happen, allowing you the insight and speed necessary to steer your project to success. See how, by taking this free 30-day trial.